If you want to build web applications in quick time then PHP and MySQL is a good choice. 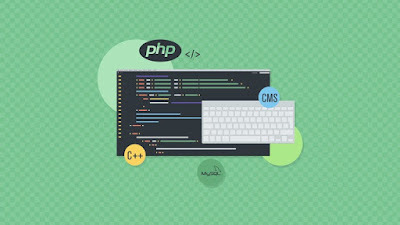 PHP and MySQL are incredibly powerful open source technologies that allow programmers and web developers to create functional websites and apps that go way beyond basic HTML. 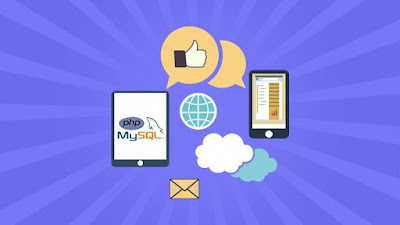 PHP is specially created to generate interactive and dynamic websites and also known as server-side scripting language while MySQL is one of the leading relational databases along with Oracle and Microsoft SQL server. While it may seem intimidating to create a website using PHP and MySQL, especially for someone who has no experience in coding, it's not that difficult. With the right guidance and resources e.g. books and courses you can put together a PHP MySQL website in a week or so. I have been sharing a lot of free resources in the past starting from Java, Spring, Eclipse, Maven, Linux, and several other key technologies important for programmers and web developers, so when a request comes to me for suggesting some free courses and books learn PHP and MySQL, I thought of this article. I started my search with Udemy because that's my go-to place for learning nowadays. I was a nerd before, I loved learning from books but ever since I have started with learning from online courses, I have never looked back. I still read books but most of the new stuff I am learning related to programming, marketing, or film-making is all via online sources only. I have bought more than 50 courses from Udemy on their flash sales (where they sale courses on $10.99) on different topics and now I am learning based on my priority and interest. In this article, I am going to share some of the best but free online courses you can join to learn PHP and MySQL by yourself. Btw, if you prefer paid courses and just looking for the best course to start learning PHP for Web Development then I suggest you check out PHP for Beginners - Become a PHP Master course on Udemy. You can buy that in just $10 or $11 in Udemy's current flash sale. As I told you guys before, I found learning from Online courses much better than books, even though books still have a place to learn a topic in-depth, to a quick start and get going, nothing beats online training courses. But, if you are someone who loves learning from free resources you have come to the right place. Though most of the Udemy courses are really cheap like you can get them in $9.99 on their flash sales, they also have many free courses which you can use to start learning a new technology. Most of these free courses are from respected author and training institute which made them free for promotional purpose but they have good and structured content. You can use them to learn PHP and MySQL by yourself at the comfort of your office and home and free of cost. This is seriously one of the best course to learn PHP and MySQL tutorial. It's a free course but much better than several other PHP and MySQL paid courses you will find on Udemy. The course is very well structured and teach you all the essential PHP and MySQL concepts, tools and resources you need to build your web application. Unlike many online courses which focus on theory, this one is very hands-on and infrastructure will not just tell you but show you how to stuff. That's the one thing I look at online courses before I buy. I don't like passive courses where instructor just taught but never show something in action. It's like someone reading a book for you. If I am buying a course which means I want to see something in action because that's the best way to learn a new technology. Unless you see things happening your interest level will not grow. The author Robert Tucker, a long-time trainer, lecturer and consultant has done an amazing job in explaining how to create a functional PHP / MySQL interface from beginning to end, explaining where needed the important technical points without relying on excessive jargon. In short, one of the best free PHP and MySQL course to learn how to develop a fully functioning web application on your own. 2. Learn E-Commerce Website in PHP & MySQL From Scratch! This is another awesome free course to learn PHP and MySQL from Udemy. While the previous course was great in terms of educating you with PHP and MySQL and showing some of the essential stuff, you really need to do a project by yourself to apply whatever you have learned. This is critical for your learning and this is what this course teaches you. In this course, you will learn to create an Online Shopping Store (E-COMMERCE) website in PHP & MySQL from scratch with Paypal Integration. The course will teach you to step by step how to do create the project and the knowledge you have learned in the previous course will help you to grasp the material and complete the task at your hand. I recommend you to create the project at your end along with the course to make the most of it. If you are a beginner who has never created a mega project in PHP then this course will help you a lot. It can also help you in creating your final year project for your university or college. This is another hands-on course which will teach you PHP and MySQL by building a project, a real-time chat system. This was actually my project on final year college submission and many of you might have done it before on different programming language. 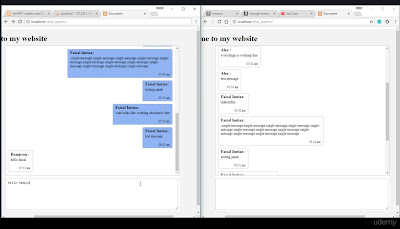 We were inspired by Yahoo Chat messenger at that time as there was no Facebook but I like this project because you can easily relate to it which makes learning easier. In this course, you will build a real-time online chat application using PHP, AJAX, and MySQL database. The course will teach you everything from front to back e.g. creating front end in HTML and styling using CSS to make it more attractive and beautiful. 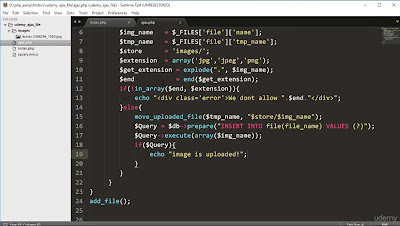 File upload is an essential task for developing web application e.g. most of the application e.g. Facebook or Twitter allows their user to upload images and files, but how do you upload a file while building a website using PHP and MySQL? Well, this free course will teach you. In this course, you will learn how to upload files to the MySQL database and how to delete files from the MySQL database using Ajax technique. In this course, you will learn plus PDO (PHP data object) which is the advanced query language. After completing this course you are completely able to upload files to the MySQL database. In short, you can use this course along with the first one to learn PHP and MySQL better and quicker. This is another awesome, hands-on PHP and MySQL course which will teach you PHP by doing things rather than just teaching stuff. Int his course you will learn how to create a CRUD application, which is what most of the web applications are. CRUD is a short form of Create, Read, Update and Delete which are four essential task website allows their user to do. Learning this concept will help you to better understand how to create registration system in PHP, and also it will help you to let your users interact with data if you building users based website like Facebook where users have the ability to update their messages or upload their images. in this course, you'll build a simple TODO list app that will help you to understand how CRUD actions are implemented and how pagination works. You'll build a database and interact with it and also use the Bootstrap framework from Twitter for styling your website. In short, a great hands-on course for junior web developer and web designer or anyone who is interested in web development using PHP and MySQL. That's all about some of the free online training courses to learn PHP and MySQL from scratch. These courses are really great resources and some of the course, especially "Beginner PHP and MySQL tutorial" is better than many paid courses and 182,255 enrolled students just prove that. I don't mind paying money for such kind of course because they are worth it. Anyway, you can get that for free and many other practical courses to kick start your PHP and MySQL journey. Thanks for reading this article so far. If you like these PHP and MySQL courses then please share with your friends and colleagues. If you have any questions or feedback then please drop a note. P. S. - If you are learning PHP and MySQL to become a Web Developer then I suggest you to first take a look at The Web Developer Bootcamp course from Colt Steele, its the best course for web developers and you will learn a lot about Web Development not just one backend framework.